Breaking away from their business as a videogame marketplace, G2A have released the first project from their in-house development studio, the imaginatively titled G2A Land. 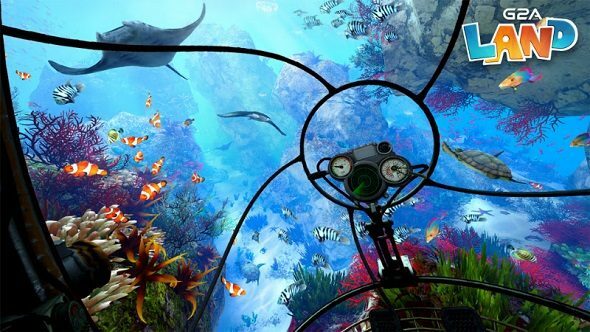 This virtual reality experience has entrants going round G2A’s own theme park, complete with rollercoasters, an underwater world and shooting gallery. Dust off that VR headset, here are the best PC VR games. The park is made up of five experiences: a ride through a massive aquarium in a yellow submarine, a special Gotham VR section where you drive around on the Batbike, a rollercoaster which circles the whole park, a shooting range and a virtual cinema. In its current state, most of these experiences just have you looking around with your Oculus Rift on, but G2A say that the Oculus Touch will be compatible with a future update to liven up the experience. The actual design of the park is what would happen if Columbia from BioShock Infinite collided with a massive G2A ad, as you travel round this neoclassical city with huge G2A logos appearing everywhere you look. While the visuals are colourful and the rides are no doubt thrilling, you’re essentially paying $9.99 to sit still. You’re even paying to see ads, as there are tents for the G2A Shield dotted around the park. This is the first project from G2A Dev Studio, so there are probably just using this as a way to get used to VR tech. Their other VR project is a shooter called Blunt Force, which has you time travelling through WWII, shooting Nazis and chucking glasses at bartenders. It’ll definitely be a more action-packed experience than sitting in a VR cinema. G2A Land is available on the Oculus Store for $9.99.